Six shots. Five dead. One heartland city thrown into a state of terror. After a sniper kills five people in Pittsburgh, Pennsylvania, in random, police arrest a man named James Barr (Joseph Sikora). 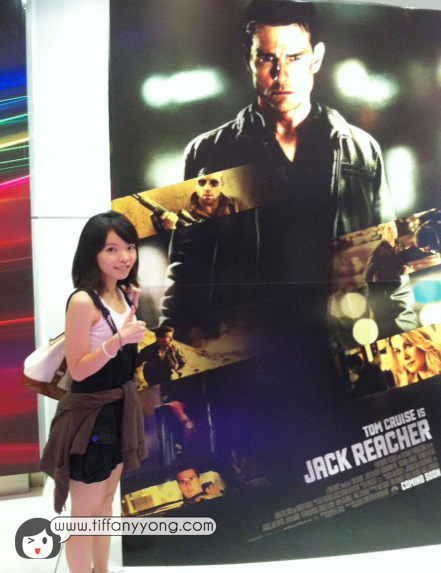 He ask only for Jack Reacher (Tom Cruise), a drifter and former Army Military Police officer. And sure enough, ex-military investigator Jack Reacher is coming. He knows this shooter-a trained military sniper who never should have missed a shot. Reacher is certain something is not right-and soon the slam-dunk case explodes. Teamed with a beautiful young defense lawyer (Rosamund Pike), Reacher moved closer to the unseen enemy who is pulling the strings. He knew that no two opponents are created equal. And the only way to take him down is to match his ruthlessness and cunning-and then beat him shot for shot. Thanks United International Pictures(UIP) Singapore for the movie invite! If I have to use three words to describe this movie, it will be “Heart-stopping”, “Fast” and “Mind-teasing”. I like the few moments when the plot teases us to thinking, “I knew this would happen” to “awww… shucks, I’m wrong”. The constant surprises kept me on the edge (plus the super cold cinema), trying to figure out how everyone is connected and what their true motives are. I find it pretty cool how Reacher reach to the conclusion that Sandy and the 5 “brothers” were actually paid to hit on him, and of course the police part was a MEGA shock. One particular funny moment was the conversation between Robert Duvall (Cash) and Tom Cruise (Reacher) when they were trying to find a wave to save Helen, the lawyer. It’s pretty hilarious and amazing how Reacher managed to kill the few people and even take down the real killer without a gun. One down-side of the movie is perhaps, it left me and my friend wondering if there’s another mastermind as it was a sudden and abrupt end to the film. I read on wikipedia that the film is scheduled to be released on December 21, 2012, with a premiere at Pittsburgh’s SouthSide Works megaplex on December 15, 2012, but Paramount Pictures announced it was indefinitely postponing a premiere screening of the film in Pittsburgh, Pennsylvania, out of respect for the families of the victims of the Sandy Hook Elementary School shooting that had occurred the day before. I felt that it was a decision well-made as the scene DID remind me of the Sandy Hook shooting case. Kudos to the McQuarrie and Tom Cruise for making that decision. Overall, this is definitely an action thriller worth your money! It’s worth your money and time! Watch the Behind the scene for some crazy action! Jack Reacher is out in cinemas on 20th December 2012. Click here to visit the Jack Reacher Official Movie Site and United International Pictures Singapore Facebook Page. Event invitation from UIP Singapore. No monetary compensation was received for the movie review.